Mount Vernon – Kristen D. Burton, Ph.D.
Every year, Dave Pickerell makes a trip to Mount Vernon to work with the distillers. Dave has a long history of working at Mount Vernon; he did whiskey distilling demonstrations before the new distillery was built, and he has had a hand in the production of every batch of George Washington’s reconstructed rye. 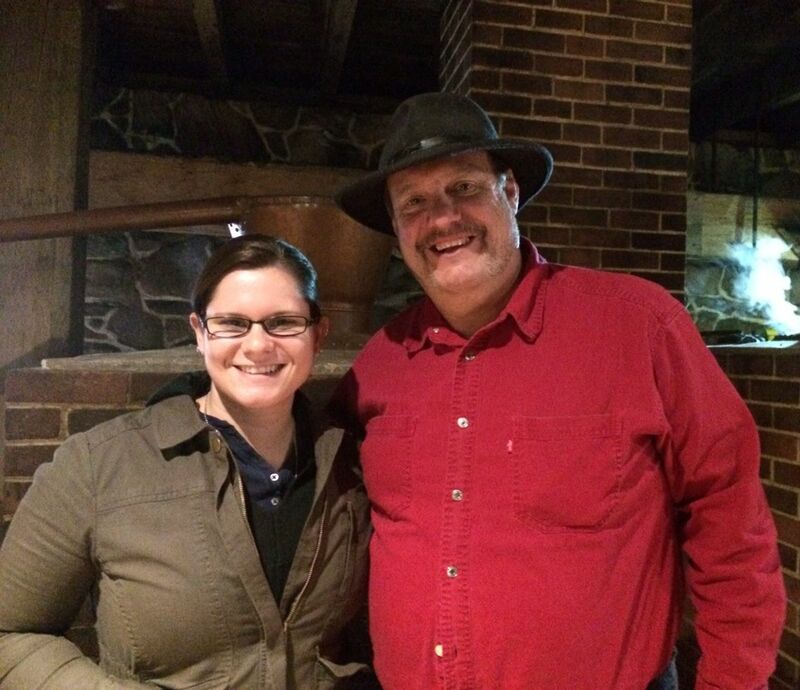 Needless to say, getting a chance to meet Dave and chat with him about making whiskey, the history of American whiskey, and the modern whiskey industry was a real treat. I certainly hope we get a chance to chat further in the future. Cheers, and happy Throwback Thursday. Those who have been following this page probably know that I spent the past fall semester working at the Fred W. Smith National Library for the Study of George Washington at Mount Vernon. I did this after receiving a three-month fellowship offered by the library (you can learn more about the fellowship program and how to apply here), which provided me with ample time to conduct research, write chapter drafts, and enjoy the events held at Mount Vernon. 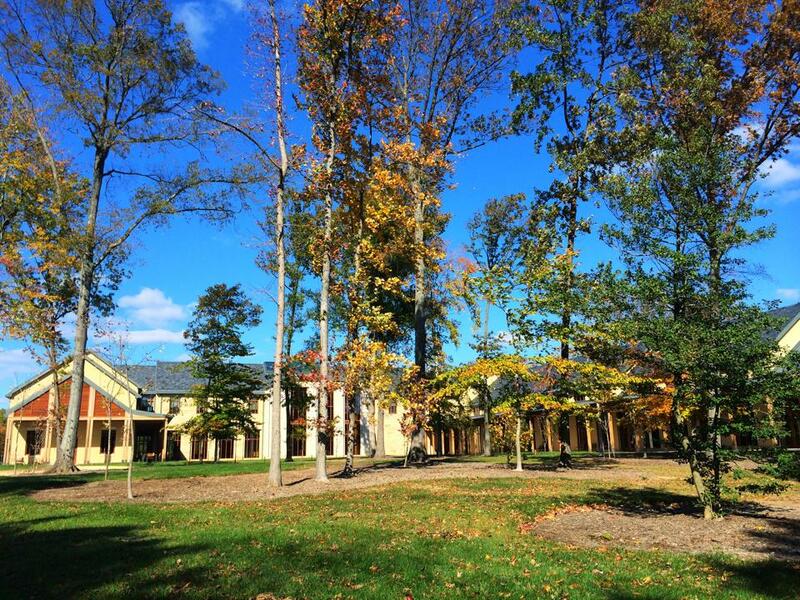 It would be an understatement to say that it was a remarkable experience, especially as I was there in the midst of the gorgeous Virginia fall weather. The Fred W. Smith National Library from the back. Many of the events held at Mount Vernon seemed to be a perfect fit for my research. The whiskey and beer dinners were not only fun, but these events helped me get in touch with the folks who worked at the Mount Vernon whiskey distillery. The distillery offers tours to the public through the end of October – after that point, the distillery goes into operation. Therefore, the first two months of my fellowship were largely focused on manuscript research and writing. This was a true pleasure, as it included working with the original manuscript of James Anderson’s ledger for Washington’s distillery. The size of the book surprised me, especially as the enterprise was a new one for Washington only agreed to the construction of a distillery after Anderson, his Scottish farm manager, convinced him to give it a shot (and after Washington conferred with John Fitzgerald, a rum distiller, to see if it actually was worth trying). Fitzgerald responded to Washington’s inquiry affirming Anderson’s knowledge of distilling and claim that whiskey production would result in profit. Washington ended up funding Anderson’s plan for a distillery, and once the distillery began operation, Anderson kept careful notes on its operation in the ledger pictured above. The distillery only operated for a short time. It began production in October of 1797, and by 1799 the distillery produced around 11,000 gallons of whiskey. Following Washington’s death at the end of 1799, though, the distillery never matched that output again. Anderson left a few years later, and in 1814, the distillery was destroyed by a fire. 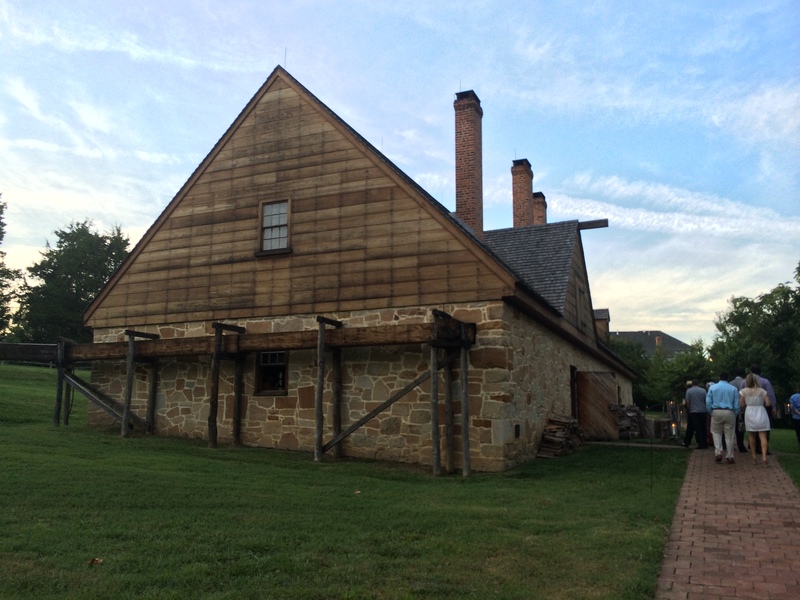 Between 1999 and 2006, archaeologists excavated the site, and a reconstructed building now stands in the spot of Washington’s original distillery. 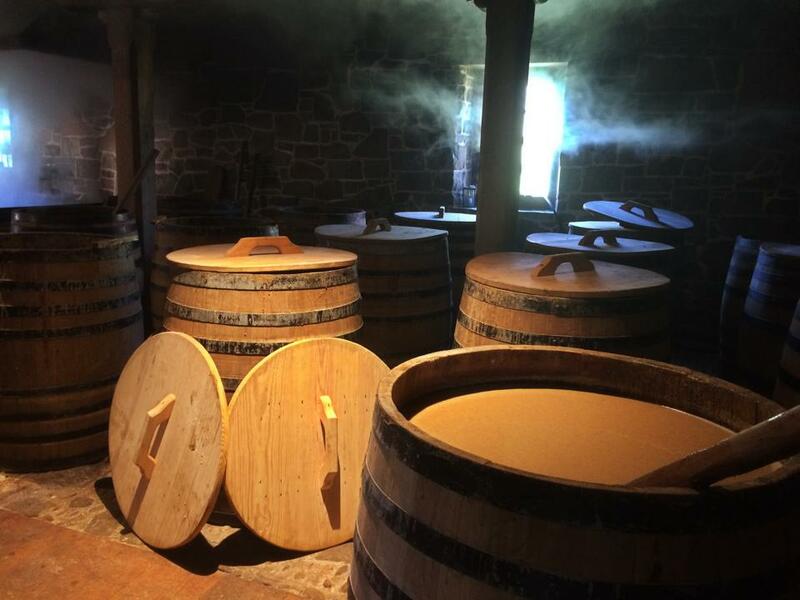 People can visit the distillery, though not while it is in production. 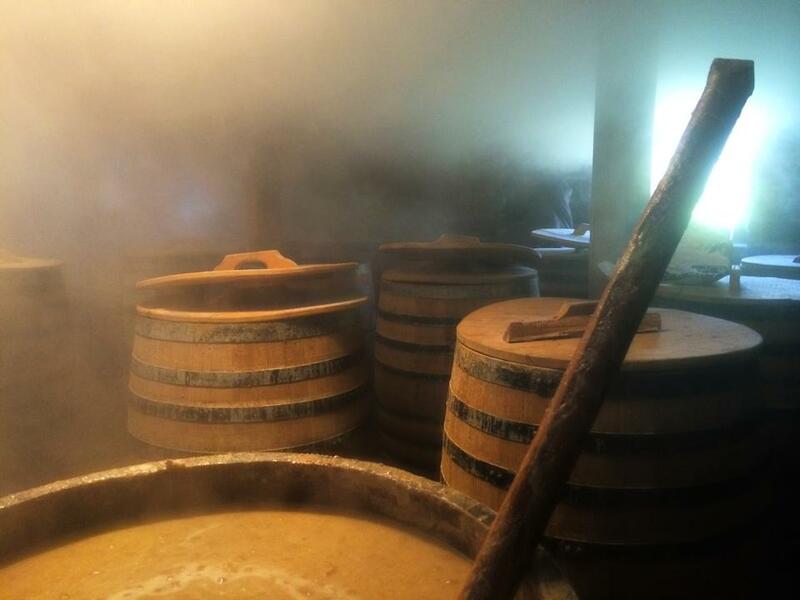 Distilling involves many hazards, and it is simply too dangerous for tour groups to mill around while the distillers are at work. Lucky for me, though, Steve Bashore, the Manager of Historic Trades and head distiller (also a UTA alum! 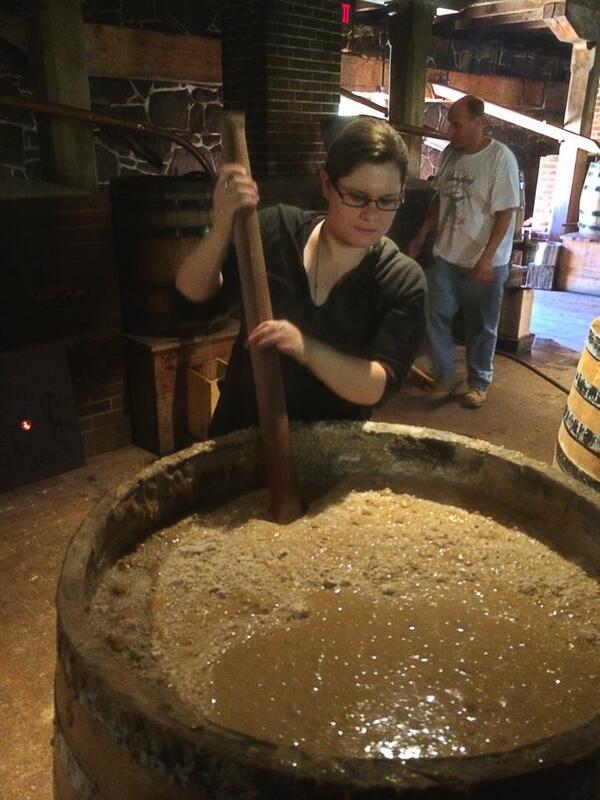 ), invited me to join them while they worked on a batch of rye whiskey. Production began November 1, and I visited about four or five times throughout the month to see how the overall process of distillation operated. The distillers take great lengths to preserve the eighteen-century distilling methods, which provided me with a unique opportunity to wrap my head around early modern methods for producing spirits. The few days I stopped by the distillery, I developed a great sense of admiration for the people who run the place today. I also gained a new perspective for the amount of labor that seventeenth and eighteenth century distillers – many who were enslaved – endured to keep the great rum industry running (whiskey production would match the scale of rum production in the nineteenth century). The people who worked at the distillery were all incredibly kind and patient as I asked an unending stream of questions. Before seeing the process in action at Mount Vernon, I had only read about the distilling process in both modern and eighteenth century accounts and guides. I read about it, but I didn’t completely understand it. It was like trying to read a cookbook without having ever cooked a meal. But seeing distilling in action completely changed the way I understood the process. A still and condenser in the Mount Vernon whiskey distillery. Terms that I had read became physical actions; cautionary guidelines became clear warnings against spoiling a batch. Words like “puke,” “worm,” and “break” took on new meanings. I was like a child attending school for the first time, and I took frantic mental notes throughout each day. The distillery, when in operation, is a busy place. The water boiler and the smoke from the stills makes the air hazy and difficult to see through. Heavy buckets of mash, burning fires, and boiling water all present hazards that threaten injury. The distillers all take careful precautions to avoid hurting themselves or others, but it seemed that each person I spoke to had their own story of ways the distillery ‘bit back’ as they navigated the production process. Luckily, I managed to escape unscathed, but I also did a lot more hanging back and observing than the rest. The haziness caused by the boiler and the smoke from the stills makes visibility difficult at times. I did participate at times, and I did my best to follow instructions. Goodness knows, I did not want to be responsible for ruining a batch of whiskey (though, I was assured by everyone there that such an outcome was highly unlikely – still, I remained cautious). 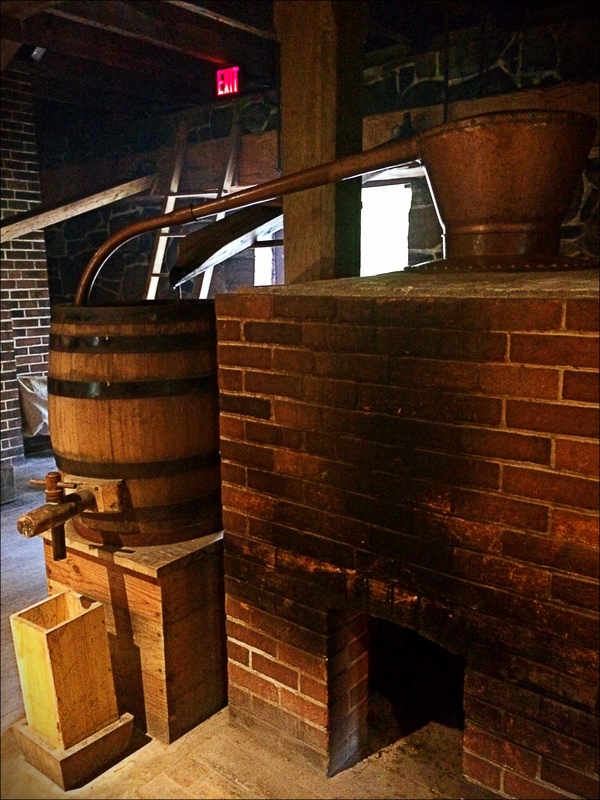 Because the distillers try to preserve eighteenth-century methods, many of the steps that are now mechanized in modern distilleries are carried out by hand at Mount Vernon. Literally – by. hand. 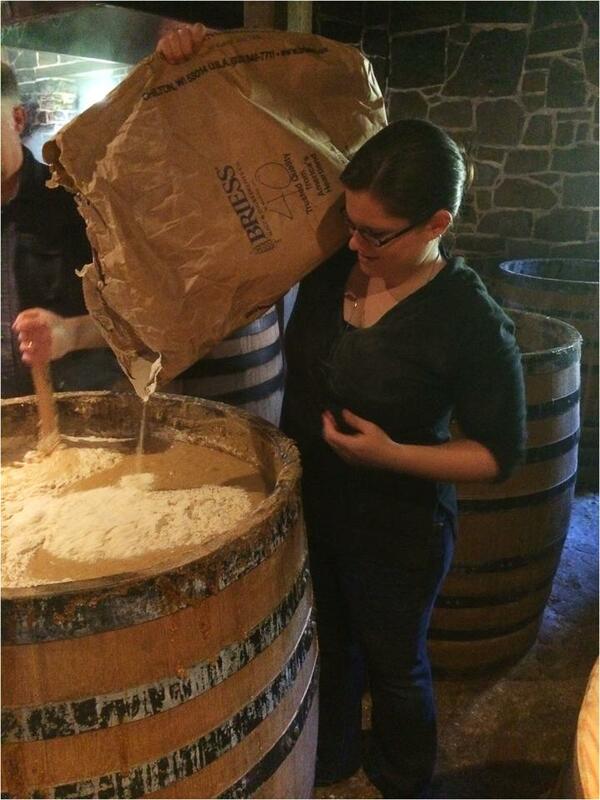 Bags of rye, barley, and malt are poured into the fermenters by hand. Boiling water is carried from the boiler to the fermenters in buckets by hand. The mash is raked, you guessed it… by hand. The entire process is remarkably labor intensive, and I will admit I was not quite prepared for physical demands the first day I visited. Still, they let me participate in almost all aspects of the process, and the experience is one I will never forget. After spending a few days at the distillery, I returned to my eighteenth-century distilling manuals, and they made sense in a way they never had before. This experience showed me how diving into the history and engaging with the actions captured within the text of primary sources can completely change the context of those words. It also underscored the difficulty historians face every time they try to recreate and understand such activities, like distilling or cooking in the early modern era. While I have gained new knowledge of distillation, it is important for me to remember what I participated in is a reconstruction and an interpretation of eighteenth-century distilling. Is it exact? Certainly not. But it was about as close as I am going to get. To all those who worked at the distillery during my time there I wish to offer my deepest thanks. Special thanks goes to Steve Bashore for inviting me to participate in the first place. You all have no idea what an impact your time and knowledge has had on my own work. Thank you.